But there’s an easy way to refresh your skin. At Impressions MedSpa, Dr. Damery provides IPL and laser treatments that can clear away skin discoloration and unwanted pigment to reveal more beautiful skin and give you a more revitalized appearance. This is commonly called a photofacial. That’s why IPL and laser treatments using the Icon laser may be the right option for you. It smoothes your skin without the facial changes and side effects associated with surgical face-lifts or injections. Dr. Damery’s goal is to get rid of, or reduce age spots and sun damage. State-of-the-art laser and IPL treatments for sun damage and age spots can take years off your skin with just one treatment. At Impressions MedSpa, our goal is to deliver visible results quickly, and we believe IPL pigmentation ablation, also called a photofacial is a powerful treatment alternative to microdermabrasion and chemical peels.Treatment sessions take just minutes, so you can resume your busy life with little downtime. Pigmented areas appear as darker spots compared to surrounding skin. 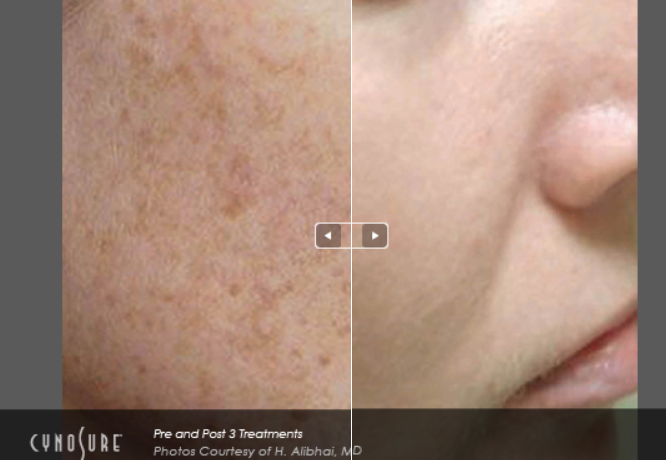 The lasers at Impressions MedSpa are specifically designed to focus on these pigmented areas without harming surrounding skin using Intense Pulsed Light (IPL), often creating visibly noticeable results after just one treatment. In just a few simple treatment sessions, pigment usually appears lighter and your skin looks clearer and younger. But what about those red pigmented areas, called rosacea and also facial spider veins. Are you bothered by these too? If you are, then boy do we have a surprise for you because our IPL treatments for brown spots will also treat the red spots of rosacea, as well as spider veins of the face. 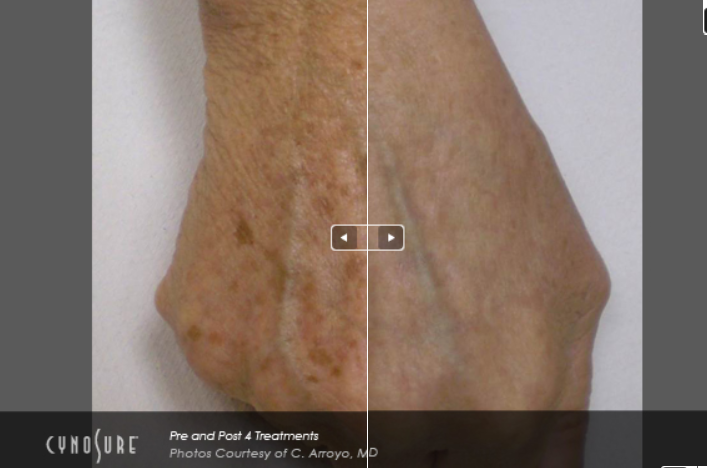 Not only will your brown spots get treated, but so will rosacea and spider veins. So our photofacials should really make an impact to help restore that youthful skin that we all took for granted all those years ago. Between reduction of your brown spots, closure and sealing of your spider veins, and treatment of rosacea, your friends will sit up and take notice. Your skin will be pulsed with light energy using either IPL or laser energy. The energy is delivered deep into your skin where it is absorbed by your brown pigmented areas as well as the hemoglobin in your small blood vessels. The brown (melanin) pigment is shattered, which stimulates your immune system to clear out the shattered melanin containing cells. New collagen growth is stimulated, resulting in refreshed healthy-looking skin. You can expect to see a decrease in the appearance of brown spots, sun damage, and wrinkles resulting in a smoother, more even skin tone. Of course results vary from person to person. Your small blood vessels have a different response. When the pulse of light strikes the spider veins, the hemoglobin within the vessel is heated and it acts to seal and collapse the vessel. Tada’, no more spider vein. Multiple treatments may be needed; depending on the severity of your pigment. We recommend a package of 4 treatments given 1 month apart to get best results. After each treatment is completed, your pigment will temporarily darken and then will slough away to reveal your clearer skin. You wouldn’t think that a beam of light could hurt, but it can. At Impressions MedSpa we just don’t like pain, no matter how small it is, therefore we will recommend a numbing cream before your treatment. Does IPL work on everybody? We wish we could say yes, but some folks just don’t respond the way most people do. Unfortunately we cannot tell how your pigmentation areas will do but we guarantee you that we will do everything possible to make your treatment session successful. Your success if our ultimate goal. Most people resume regular activities immediately following the treatment session. You should wear sunscreen and avoid the sun for a few days.